Chocolate Crinkle Cookies and I have never been besties. Sure we’d chat for a few minutes to be polite (ahem, I’d eat one), but our relationship felt hollow. The chocolate crinkles promised me they’d be fudgy, soft, and decadent, but each time I tasted one, it was disappointingly bland and dry. I know I can’t have an intimate, fulfilling relationship with every cookie recipe, but the shallowness of my affair with Chocolate Crinkle Cookies bothered me. I felt like I should like chocolate crinkle cookies. I wanted to like them. The concept is simple and superb: soft, fudgy cookies reminiscent of brownies and cloaked in powdered sugar. Each crinkle cookie I tried, however, squandered its potential. They’d be too dry or too thin or the center wasn’t as rich and truffle-like as I felt it should be. After sampling dozens of duds and deciding I’d become obnoxiously Goldilocks about this entire chocolate crinkle cookie situation, I decided to come up with my own twist that was juuuuuuust right. My solution for chocolate crinkle cookie satisfaction: Peanut Butter Chocolate Crinkle Cookies. They are intensely chocolaty, pillowy soft, thick, and the centers are so molten and fudgy, they remind me of chocolate lava cake. 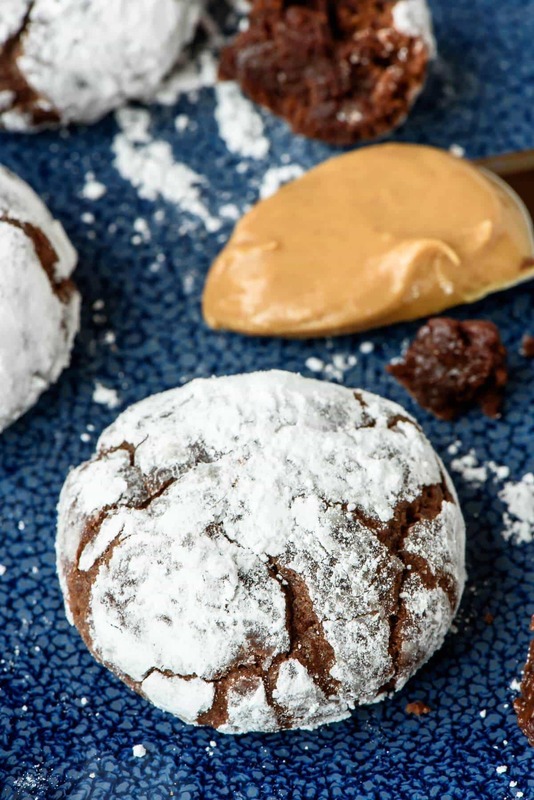 Plus, in addition to chocolate, these crinkle cookies offer chocolate AND peanut butter, a combination that is simply not to be resisted—not that you were thinking of trying, were you? For the most supreme fudge texture possible, I used melted dark chocolate in place of cocoa powder and added a pinch of espresso powder to amp up the intensity of the chocolate flavor even more. 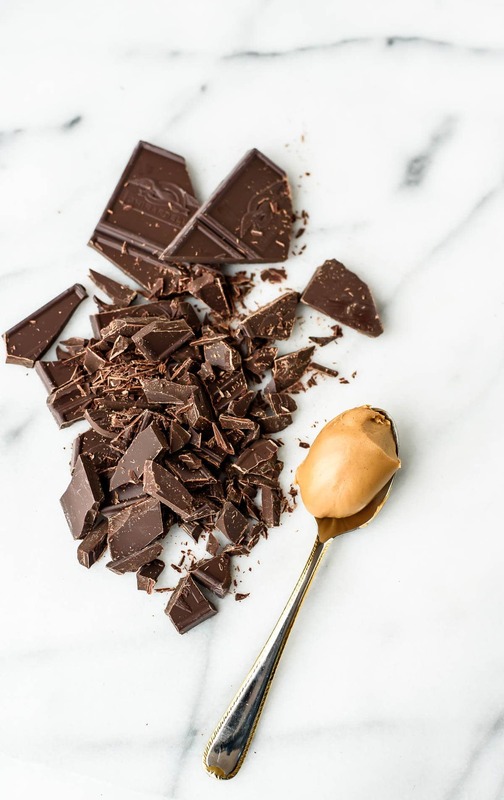 Peanut butter is melted in right along with the chocolate, and the rest of the ingredients come together in a single bowl. The final batter tastes like a peanut butter brownie, and it falls into the category of desserts you need to physically restrain yourself from eating in their entirety, prior to actually baking them. 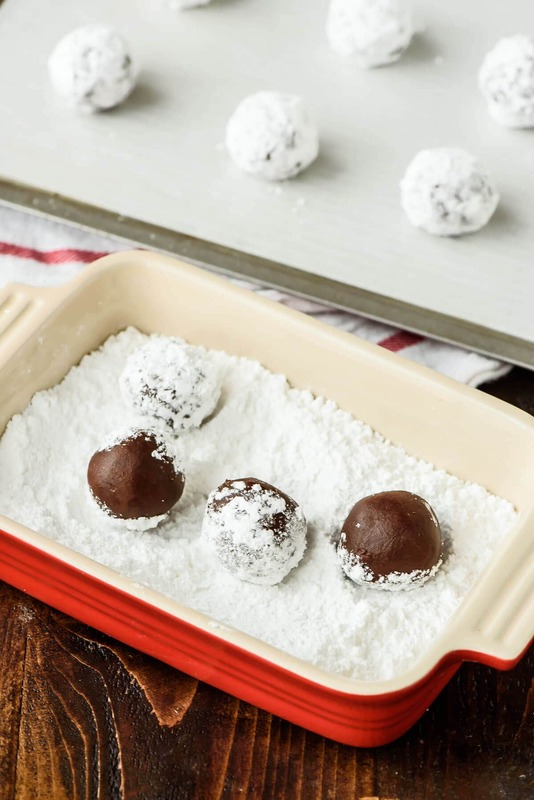 Be generous with the powdered sugar, arrange the cookie balls on your baking sheet, then pop them into the oven. The signature “crinkles” form as the cookies bake. 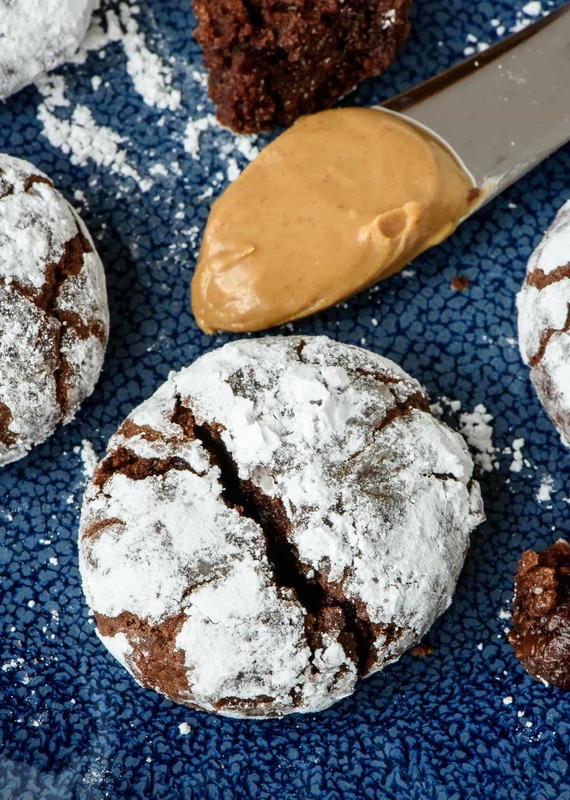 I know many of you likely have been baking (and eating) chocolate crinkle cookies for years. I hope you’ll give this fresh version with peanut butter a try, no matter the status of your current crinkle-cookie relationship. 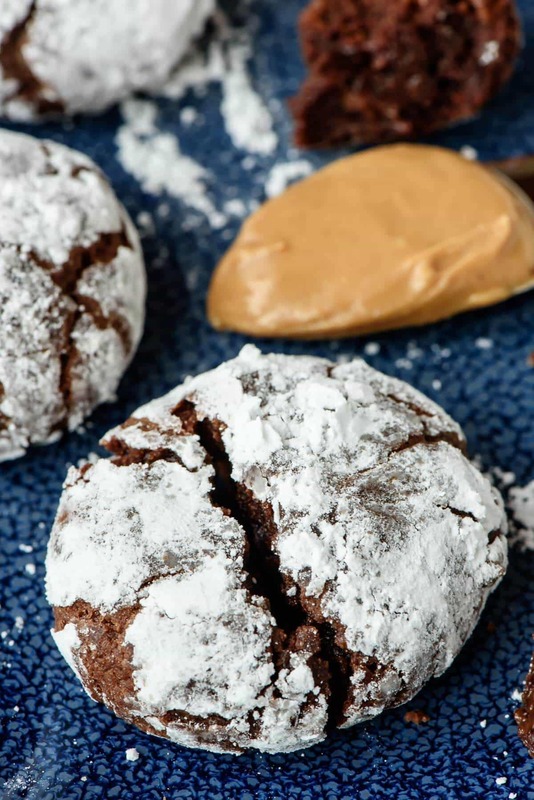 If you love brownies, peanut butter, or chocolate in any combination, these Peanut Butter Chocolate Crinkle Cookies are sure to be your new bestie too. Yield: 36 small cookies, approx. Everyone's favorite chocolate crinkle cookies made even better with the addition of peanut butter. 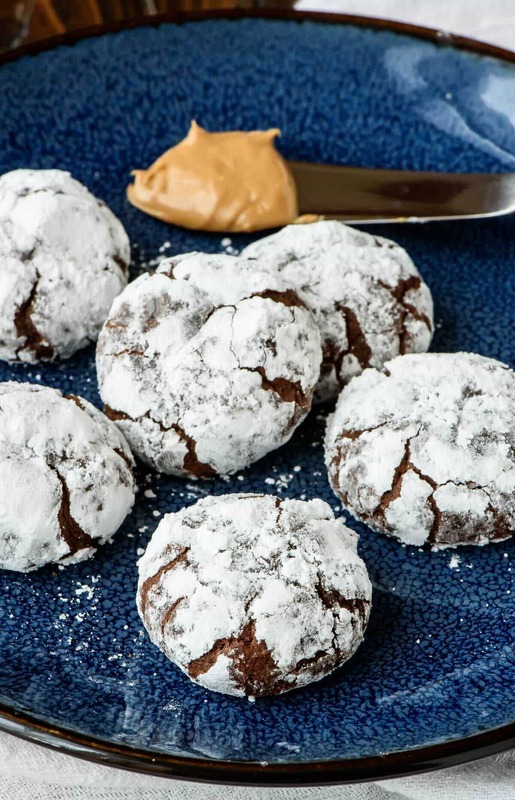 These are the softest, fudgiest chocolate crinkles! 1 1/4 teaspoons instant espresso powder — optional, but delicious. Enhances the chocolate flavor. Melt the chocolate, butter, and peanut butter in a small saucepan over medium heat or in microwave-safe bowl. (If microwaving, heat in 15-second bursts and stir between each.) Once the butter has melted, remove the bowl from the heat and stir until the chocolate melts completely and the mixture is smooth. In a large mixing bowl, beat together the sugar, eggs, vanilla extract, and espresso powder until well combined. Pour in the chocolate mixture, baking powder, and salt, then stir to combine. Stir in the flour just until it disappears. The dough will seem very, very soft. Cover the bowl and chill the dough for at least 3 hours or overnight (it will firm up considerably). When ready to bake, preheat the oven to 325 degrees F. Line a baking sheet with parchment paper and set aside. Place 1 cup powdered sugar in a wide, shallow bowl. With a small cookie scoop or spoon, scoop out heaping teaspoon-sized portions of dough and roll into balls that are 1 1/4 inches in diameter. Place 4-6 balls of dough in the powdered sugar, then gently roll and toss the balls to coat completely (if you do too many balls at once, they will stick together). Shake of excess sugar, then place on the prepared baking sheet, leaving 1 1/2 inches between each (the cookies will spread as they bake). Repeat with remaining cookies. Bake for 10 minutes, rotating the pan halfway through the baking time by turning it 180 degrees, and if baking multiple cookie sheets at once, switching the top and bottom pan positions. When the tops are dry and just set, remove the cookies from the oven. Let cool on the baking sheets for 2 minutes, then transfer to a wire rack to cool completely. Leftover chocolate crinkle cookies can be stored in an airtight container at room temperature for 3 days or frozen for up to 1 month. Seriously, I never really understood what chocolate crinkle cookies were missing…until now. You’ve added PB and that is a serious game changer! Now I want them! I’ve never been a fan of traditional crinkle cookies, for the same reasons as you explained. Life is too short to eat dry cookies! These look wonderful, like a cross between chocolate crinkle cookies and peanut butter kiss cookies. Yum! Oh I’m sure I would love these! Chocolate and peanut butter! Yummy! These cookies both look and sound really great! yum, chocolate lava cake in cookie form, what could be better? I love this fresh twist on a classic favorite, Erin! Anything with chocolate and peanut butter is an A+ in my book. Pinning! You are too adorable for words! Love reading your recipe introductions. A cookbook in the near future? Looking forward to it! It would be a pleasure to read and have your delicious recipes in a book form. P.S. Chocolate and peanut butter are the ultimate combo! Well, those or chocolate and mint! Heyam, you are making me blush!!!! If I write a cookbook, I’ll definitely be posting all about it here, so you’ll know :) And chocolate and PB or chocolate and mint, which is greater? I’m glad I never have to choose just one for life! These are definitely cookies I could have a torrid affair with!! Made these this weekend. Delicious! Definitely making these again. I’m so, so happy to hear that Katie! Thanks for trying the recipe and for taking time to leave your review. Enjoy every bite! Clearly you know how to do up the cookie right. There ain’t nothin’ wrong with chocolate and peanut butter together in a fudgy cookie. Love these! O! M! G! My family is convulsing in ecstasy over these cookies right now. Now that’s a reaction I love to hear :) Thanks so much Heather! I’ve made Chocolate Crinkle cookies for more years than I can count. My mother kept the original recipe from the Blue Bonnet box (1970’s), which is hard to find (Blue Bonnet doesn’t even publish the same recipe today). Instead of using coco powder it called for 4 ounces of unsweetened melted chocolate. The ultimate trick is in the cooking for making sure they aren’t dry. Always use parchment paper, bake them at the minimum estimated time, and take them off the cookie sheet as soon as they come out of the oven (even if they look slightly wet). The cookies continue to bake if left to cool on the cookie sheet and never do more than one cookie sheet at a time. They are labor intensive but my grandchildren (who are adults now) would rather have cookies than gifts at Christmas. I tried this recipe today and think the 8 ounces of chocolate overpowered the 1/4 cup peanut butter. They are truffle like but would have liked to had more peanut butter flavor. I will try again however however adjusting the amount of chocolate. Thanks for giving this recipe a try, Cathy, and sharing your feedback! I would love to hear what you think once you tweak the amount of chocolate to your preference. Just finishing baking my first batch of these. Can’t wait til they cool off enough to taste one! But I’m curious about the cookie sheet rotation. What is the reason behind that? Hi Terrie! Most ovens bake a little unevenly, so that helps keep all the cookies brown perfectly and no one part of them to get overcooked. I hope you loved them!